Crunchyroll - FEATURE: Speak, Fan, and Enter! Heroes & Gatekeepers in "Akiba's Trip"
FEATURE: Speak, Fan, and Enter! 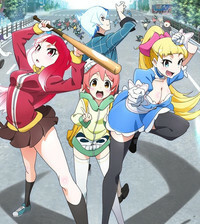 Heroes & Gatekeepers in "Akiba's Trip"
"Akiba's Trip encourages fans to share their passions, teaching instead of testing"
As that description probably suggests, Akiba's Trip is an up-front, silly fanservice show about stripping people that takes its ogling about as seriously as it does its story. While I'm not usually a fan of the 'service, Akiba's Trip has charmed me with its enthusiastic characters and overall joyful tone as it takes its audience on a wacky, loving tour of the many hobbies and fandoms that make up the Akihabara district. 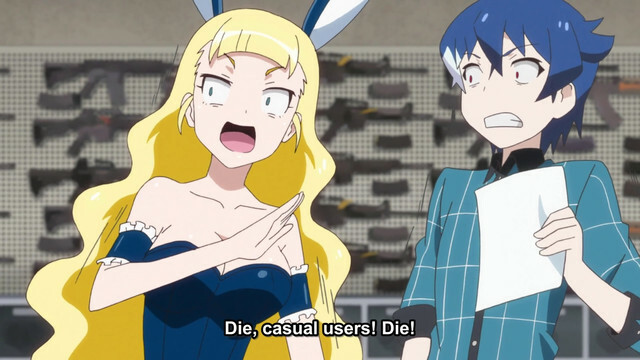 And, unlike many series about nerd culture, Akiba's Trip and its cast are positive-minded dorks more than happy to share their passions with others. Right from the start, it's clear that the series is a celebration of trivial pursuits, less interested in the Lonely Suffering Nerd™ and more in the bonds that can build from sharing common interests. This general optimism is embodied in our short-sighted, shallow, but well-meaning protagonist, Tamotsu. While he has a hint of the hipster to him, taking pride in his “unpopular” interests, and while it's suggested that his life outside of Akiba is, er, less than ideal, he's almost never snobbish or bitter about it. As demonstrated when eccentric cosplayer Arisa nabs the last rare figure on the shelf before he can, Tamotsu doesn't sulk or demand her Nerd Credentials to see if she's “worthy” of the item. 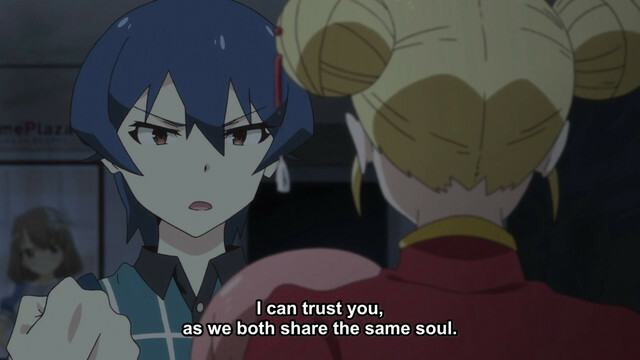 Instead, realizing that she's a fan of the series, he asks to talk with her more about the series, declaring them “already friends” because they “share a value.” Arisa later bonds with team leader Mayo for a similar reason. 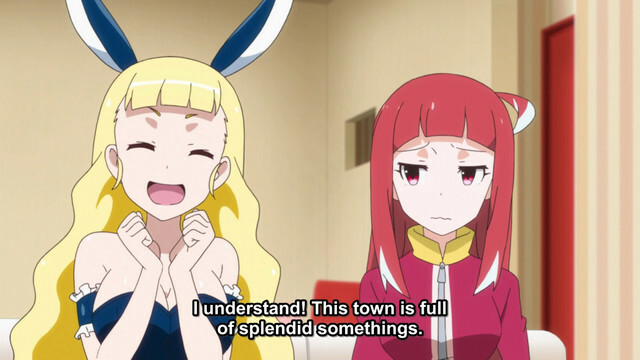 In Akiba's Trip, being a geek is seen as an opportunity rather than a curse, allowing people to swiftly form friendships with like-minded people. 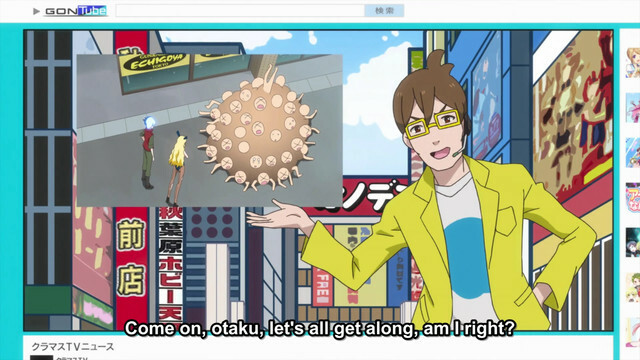 Our antagonist is literally a militant nerd gatekeeper, and Akiba's Trip sees him for what he is: A jerk, both nuisance and threat to other fans and the culture as a whole. In a moment of true heroics, our flawed protagonist unhesitatingly shuts him down, reminding him that “You have to treat newcomers well. That's the only way any content can survive.” He also points out that “everyone started off as a casual user,” which the Militant Gatekeeper frantically tries to pretend isn't true but obviously is. It's a brief, perfect exchange, highlighting the two greatest flaws of hostile nerd hierarchies and gatekeeping ideology: (1) That thing you love will stagnate or even die if others don't discover and fall in love with it too, and (2) there was once a time when you couldn't tell a shounen from a shoujo either, so maybe cut the kids some slack, okay? Rather than scoff at newbies and “casuals,” Akiba's Trip encourages fans to share their passions, teaching instead of testing. The Militant Gatekeeper is by far the most thematically on-point villain thus far, but every possessed antagonist has generally been depicted as someone who took their hobby too seriously, focusing on authority or profit instead of the reason they got into this field in the first place: Because it was fun. To Akiba's Trip, passion is productive; zealotry is destructive. This is as true in fandoms as anywhere else. The entire tone of the series carefully toes this line between joy and mockery, which keeps it from becoming either too cynical or too conceited. It's a show about goofing around, and it finds value in that without deifying it. Akiba's Trip depicts its geeky district as a vibrant, welcoming place where anyone with an interest can come to play, hopefully with friends in tow. It may be a silly fanservice show about stripping to save the day, but that sense of hospitality is infectious. I just can't stop returning to its door.